This is the only polish I picked up from Essie's Winter Collection. 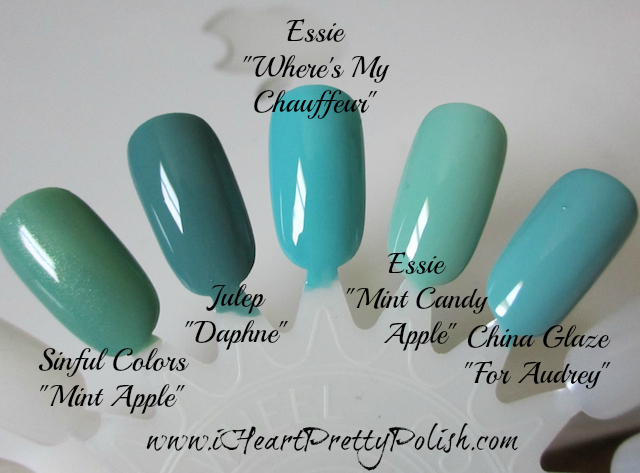 Where's My Chauffeur is described on Essie's site as an "Opulent Turquoise". Opulent means ostentatiously rich and luxurious. Where's My Chauffeur applied pretty streaky and thin. I needed 3 coats to achieve this look. Even though many of my Essie polishes have a formula like this, I still like them because the end result is worth the trouble. This is such a pretty and vibrant turquoise and I love it so much. It's a really bold color on the nail. I took a chance when buying this because I was worried that I would have a dupe at home. It turns out, I don't have many dupes. I didn't want to ruin my manicure by comparing them on the nail, so I painted the comparisons on a nail wheel. As you can see above, Where's My Chauffeur is a lot more blue than the other turquoise/mint polishes I have. The closest would be China Glaze For Audrey. Today I will remove the polish on two of my nails and throw For Audrey on for comparison on the nail. Many of you have "For Audrey", so I'm thinking by the swatches above, you wouldn't need Where's My Chauffeur. I'll let ya know...I just swatched them on my nails and they aren't dupes. For Audrey is lighter and a tad more green. Where's My Chauffeur is more bold and blue. Did you pick up any polishes from Essie's Winter Collection? Oooo this color is beautiful, like the tint of blue more compared to For Audrey.. Thanks for putting up the comparison on the nail wheel. I haven't picked up any of their winter colors but this is beautiful! I just may have to buy it. I so have this entire collection and I cannot wait to swatch. I beg to differ. 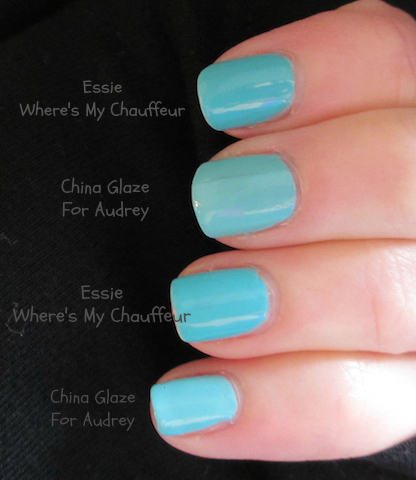 When everyone was raving about China Glaze For Audrey I was a bit perplexed. Every way I look at it ( in the sun, artificial light, in the dark, with my eyes closed) it looks like a mint green to me. Not a true Tiffany blue. 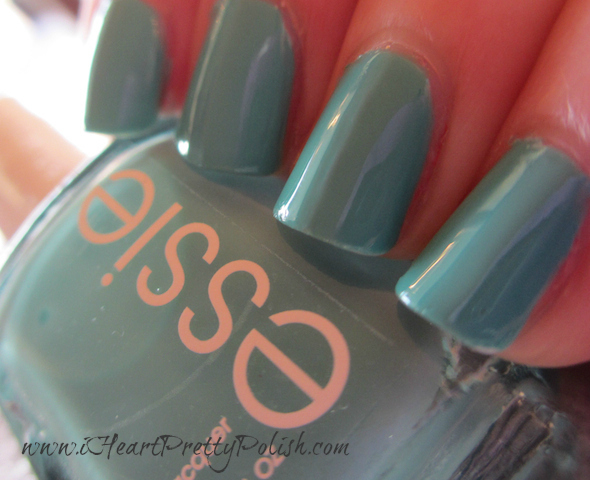 Essie gives me everything I need; it's in fist place with For Audrey a distant second. Hmmm... It looks a lot more vibrant than For Audrey, and I want!!! I'll wait for your comparison on the nails though!! Thanks for sharing this, great comparison! Thanks and you are welcome. This is so gorgeous! I have For Audrey, but now I kind of want this, to! Haha! Quit reminding me...I'm trying to forget that I saw your link.... be strong, be strong. I most definitely want this color even though I have all of the others. It just has more blue as you said and is exactly what I want! I love blue!! You are so right. What the heck? I ALMOST bought Aqua Lily. I had it in my cart and started the checkout and stopped myself. That was hard! YES! Thank you for doing a comparison! I was worried about having a dupe and therefore didn't add this to my wishlist. This color is so beautiful! Yes, it's great. And I'm glad you don't have a dupe either. Get it! I got away with just two coats. 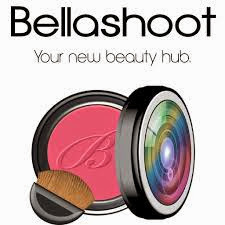 I reviewed it in my last blog post. I love this color so much! I think this is the only one I'm going to pick up -it is Tiffany Blue! yes, it's great :) Thanks for stopping by! Gorgeous color! Nice side by side comparison because I have Essie's Mint Candy Apple and a similar China Glaze color so good to know it's not exactly the same. Yes, it's always nice to find out that you don't have dupes in your collection! It's so so pretty. Essie can be streaky, but out of all the brands I've tried - it's the one that actually lasts the longest and rarely chips! I'm currently wearing Tip Top Nails Cha Cha Cha, and I do think it might be a decent dupe. It's so hard to tell on the computer. However, you must know the right company and the best services so that you get an appropriate vehicle and a professional chauffeur.